Forklift tires for immediate shipping! Universal – Possibly the world’s finest industrial press-on tire! Using a superior grade of rubber with cut resistant additives, extreme care is used in every phase of the manufacturing process, including superior bonding and accurate pressure curing methods. Long tread wear, high stability and durable construction that reduces cuts and chunking even in the most severe operating conditions, makes the universal super solid a wise choice. Use with internal combustion engine trucks and electric forklift trucks. Non-Marking – Ideal for use in paper and textile mills, food production, bottling plants and every area where floor cleanliness is important. Eliminating tire marks reduces floor maintenance costs. Using a superior grade of natural rubber with Hi-Sil ingredients (no clay), Non-Marking tire has exceptionally low rolling resistance thereby extending battery life or fuel consumption. It also boasts excellent rider comfort. Compare our quality – it’s worth the difference. Always use static straps with any non-marking tire. Electric – This tire runs cooler under heavier loads at higher speeds, permitting longer runs. Tests by a national independent commercial lab recently revealed that the SUPER ELECTRIC has a lower rolling pressure than its major competitors. Enjoy the savings resulting from extended battery life. Wire Fiber – The UNIVERSAL rubber tire is impregnated with brass wire, which increases traction and offers resistance to cutting and chunking. The wire fiber extends tire life in metal processing and other applications. It also improves traction under wet floor conditions. Fiber Glass – This tire minimizes heat build up under heavy loads while reducing power drain on electric forklift trucks. 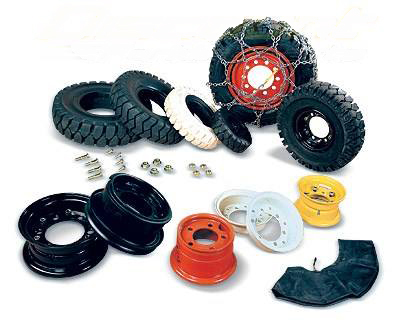 The fiberglass tire increases carrying capacity and resists chunking and chipping. Walnut Shell or Granite Chip – Both tires offer improved traction on wet, slick or frozen surfaces. These tires have extremely firm grips and reduces the danger of injury to personnel and material from skid-related accidents. Polyurethane – This polyurethane tire is a long-wearing, non-marking tire with great resistance to chunking, cutting, abrasion or chemicals. Its principal feature is to carry heavier loads for short distances. Oil Resistant – This tire is designed to extend tire life where oily surfaces are prevalent. It also offers excellent resistance to deterioration caused by petroleum products. Static Conducting – This tire offers improved protection from explosion or fire in highly volatile areas and dissipates static electricity build-up and sparking.